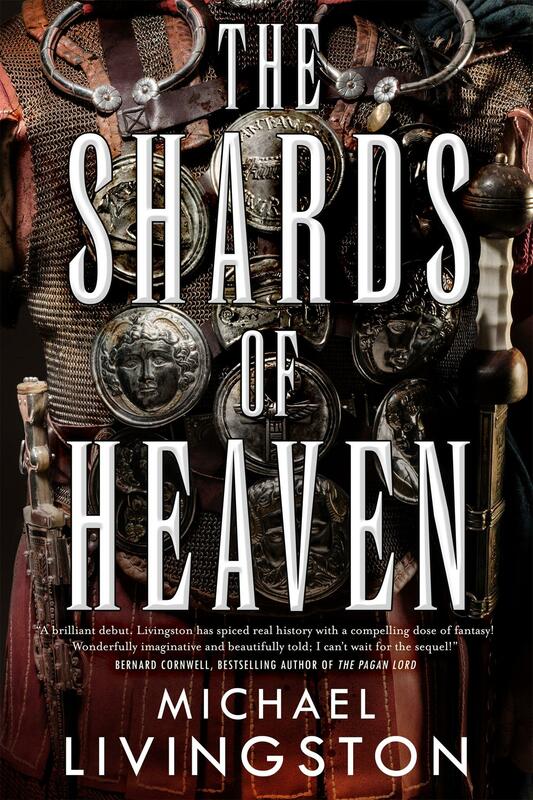 The jacket copy for Michael Livingtson’s Shards of Heaven sounded promising. I asked for the ARC immediately, and bounced with joy when I found it in my mailbox. Alas, the press release tucked into the book described it as Dan Brown meets Indiana Jones. Who am I to say Dan Brown is unreadable? Clearly millions of people find him otherwise. To me, though, Brown’s sentences and paragraphs are so relentlessly clunky, ugly, and boring, I am unable to care what happens to any of Brown’s characters. My one attempt to read The Da Vinci Code found me fighting the urge to throw the book across the room, several times on every page. So the press release made me fear for the well-being of Michael Livingston’s novel. I also feared for my own domestic tranquility: Now that I have children, my household’s penalty for throwing books is a five-minute time-out. Which was I to believe? The blockbuster-bluster elevator pitch, or the cover copy? 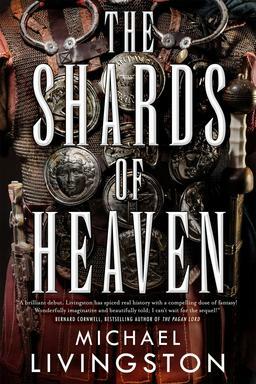 [A]s civil war rages from Rome to Alexandria, and vast armies and navies battle for supremacy, a secret conflict may truly shape the course of history: two sons of Caesar have set out on a ruthless quest to find and control the Shards of Heaven, legendary artifacts said to possess the very power of the gods — or of the one God. Caught up in these cataclysmic events, and the hunt for the Shards, are a pair of exiled Roman legionnaires, a Greek librarian of uncertain loyalties, assassins, spies, slaves . . . and the ten-year-old daughter of Cleopatra herself. 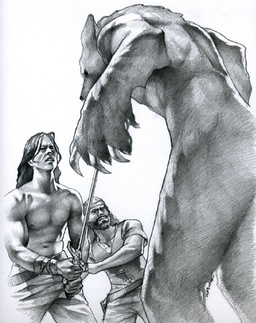 Shards of Heaven has so many of the things Black Gate readers love — epic sweep, battle and brawl, ancient secrets, women one underestimates at one’s peril, and world-shaking magic. Michael Livingston has some nice writing chops. The secret history clearly has a mountain of real historical research to give it depth. How can such a book go wrong? It doesn’t go wrong. Not exactly. It’s a perfectly adequate entertainment. Perfectly, um, adequate. I’ve dragged my feet for some time about writing this review because it feels churlish and uncollegial to damn a book with such faint praise. But this week, with David Bowie’s death inviting all of us to consider what a wilder creative process can produce, it no longer seems unreasonable to want a book that demanded its author challenge himself. In its best moments, Shards of Heaven plays with some heady ideas. The magic here is theurgy — not just invoking the divine to produce magical effects, but enacting magic upon the divine. At first, none of the characters know quite what they’re dealing with, so we get to see theurgy as a sort of experimental science. Characters from different religious traditions are struggling to figure out what they have, and filtering what they find out through their own personal and inherited perspectives, and their own skepticism.Had Livingston continued in that vein, he might have produced something really fresh and lively. Instead, alas, about a third of the way into the book, it seems Livingston realized he was in danger of writing something original, something of lasting creative value, something weird and numinous that would challenge him to grow as a writer. And instead of embracing that risk, he slammed the door on it and ran away. A character arrives who conveniently has the right answer. The right answer collapses all uncertainty, all suspense, and all curiosity about the nature of the divine and the objects that allow humans access to divine power. Every significant character who hears this right answer is immediately persuaded of its rightness. 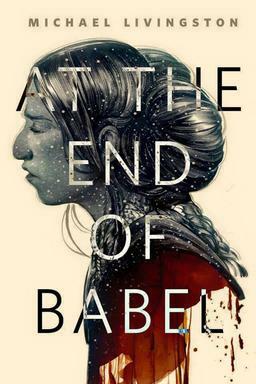 No matter what their backgrounds, personalities, preoccupations, personal blind spots, or hopes for themselves and the world — no matter which side of the war they’re on, what they’ve done, or what they expect to have to do next — they all shuck their previous cosmologies to adopt the right answer. And they all feel pretty much the same way about it. This sudden breakdown of characterization is all the sadder to see because Livingston’s characterization is otherwise quite good. It could be more subtle, but it does something I find more important and more challenging than subtlety. He’s able to create from the historical record a believably tender, complex family dynamic for the royal household Marc Antony and Cleopatra headed. By the time historical events force him to break up that family, they’ve earned the reader’s sympathy. Livingston finds wiggle room in the historical record that allows him to remain faithful to his sources while keeping up suspense about the characters’ fates as he transitions toward the sequel.But for me, there probably won’t be a next book in this series. The small-m mystery and the large-m Mystery of the Shards of Heaven have been Dan-Brownified into a rehash of … well, I won’t subject you to spoilers by telling you exactly what gets rehashed, but a rehash is what we get. As much as I would like to see what happens to most of the surviving characters, I don’t think I could read any more pages of theurgy from which almost all weirdness has been purged. Not without wanting to throw the book across the room, and there’s a limit to how many times I’m willing to put myself in time-out. I wish there were some way of writing this review that would embolden Livingston more than it would discourage him. Not every writer can even reach the kind of threshold the first third of the book approaches, and certainly not all of those writers can cross it. The better book Livingston almost wrote can be glimpsed in the book we have. I don’t know why he pulled back from exploring his best ideas and giving his characters something they could really work with. The remaining books in the series are unlikely to grow beyond this flaw in the first. Creative self-reinvention is a good thing, but not in the middle of a series. If you can forgive the Bowie analogy, most trilogies would not benefit from a first volume written in the author’s folk-rock concept-album period, a second from his funk period, and a third from his pop dance music period. Fortunately, there’s more than one way to exceed yourself as an artist. I think Livingston may have it in him to try. Whatever he writes after he finishes this series, I’ll be very keen to read it.